The OmpSs@FPGA tutorial was collocated with the EuroEXA project face-to-face meeting in Athens. Project partners attending the meeting had the opportunity to attend the tutorial and implement what they learned in the EuroEXA project. On 13 June, two BSC researchers, Daniel Jiménez and Antonio Filgueres gave a tutorial on OmpSs@FPGA in Athens. The tutorial was for partners in the EuroEXA project, who were in Greece for the face-to-face to meeting on 14 and 15 June. Nineteen attendees from eight EuroEXA partners (ICCS, Synelixis, Neurasmus, FORTH, IMEC, BSC, INFN, INAF) participated in the tutorial, the aim of which was to enable the EuroEXA partners to port their applications to FPGAs using OmpSs@FPGA. 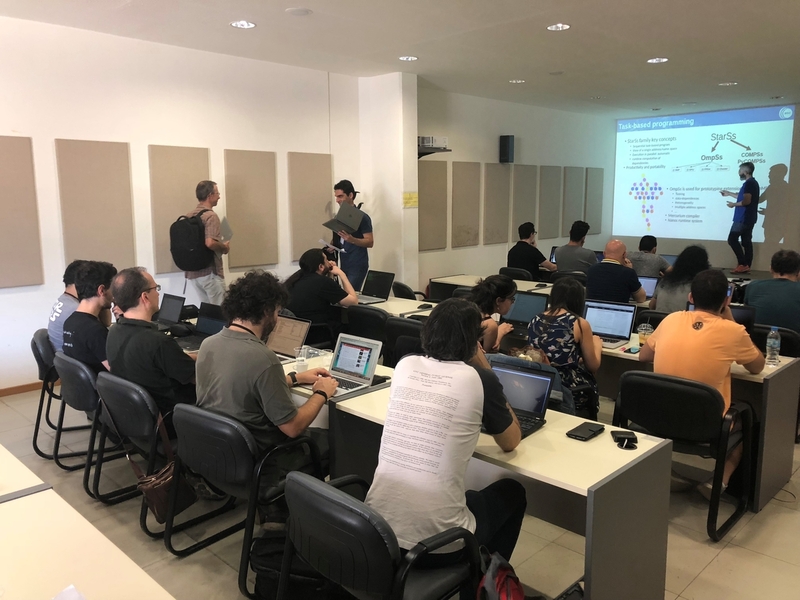 "Attendees at our tutorial are learning to use BSC's OmpSs@FPGA for the Xilinx Zynq-7000 and Ultrascale+ environments, which we target in the EuroEXA project. This will help them to exploit the use of the applications in these FPGA environments," says Paul Carpenter, Senior Researcher in the Computer Science department and principal investigator of the EuroExa project at BSC. The tutorial started with an introduction to OmpSs@FPGA, including a detailed explanation of its directives and clauses, with a particular emphasis on heterogeneous programming using the “implements” extension. Later on, the tutorial provided a description of the OmpSs@FPGA toolchain and the way applications are compiled to target the FPGA systems. After this theoretical session, the attendees had the opportunity to try out how to install and set up OmpSs@FPGA on their computers, and then apply it to a case study on vector multiplication. The hands-on session also included the deployment of the vector multiplication onto the available boards based on Xilinx Zynq-7000 and Zynq U+ chips. BSC’s contributions to the EuroEXA project include extensions to the Nanos runtime system to support the FPGAs, dataflow accelerators and clusters, as well as to optimize resiliency. Another BSC task is to develop the system’s optimized MPI library and provide a batch scheduler that leverages the memory capacity sharing feature of UNIMEM. Finally, BSC is also leading the work to understand and quantify the whole system resiliency problem.